Claire Hopkinson, Director and CEO of Toronto Arts Foundation, sat down with me to share the story of how the Arts in the Parks program came to be, where she hopes it will go in the future, and how it connects communities across Toronto. Q: You had a lot to do with the inception of Arts in the Parks. Can you briefly explain where the idea came from? Hopkinson: The idea came about some 10 years ago out of a confluence of events. I had been invited by the Chair of Parks at the time, Councillor Fletcher, to participate on a panel to increase participation in parks. I had also noticed that NYC’s parks website celebrated artistic activity in their parks and it inspired me. Locally, many arts organizations that presented art outdoors faced challenges; I knew that Dusk Dances, an outdoor dance festival, was having a terrible time renewing park permits, and it became clear that they were not alone. I thought, ‘Tax payer dollars are going to fund arts organizations to make art, and they’re forced to spend most of their money on permits and marketing for a free public event’. More so, Toronto had a wonderfully thriving robust arts scene downtown, but it was clear that if the arts were going to continue to be relevant and exciting and contribute to city life, the arts had to be experienced and enjoyed by more people around the whole city. At the time, there were very, very few places for artists to present their art outside of the downtown core. All of these factors, particularly the need to provide the Toronto public with easier access to the arts in their local neighbourhoods, seemed to point to this idea of Arts in the Parks. Q: What was the turning point that helped launch this idea off the ground and into parks around the city? Hopkinson: When John Tory was elected mayor of Toronto, he kindly agreed to host a ‘Mayor’s Evening for the Arts’ event where the funds raised would go towards a specific project. It felt like the right time to promote this idea, because his campaign had centred on the idea of ‘One City’. Arts in the Parks is indeed the embodiment of ‘One City’! We pulled together a presentation illustrating the possibility of free summer arts activities all over the city, pitched the idea, and it was immediately clear that the Mayor was enthusiastic about the project. Fantastic! It was a big idea and needed the support of both City Hall and the private sector. Significant contributions from corporations and individuals were raised through the 2015 Mayor’s Evening for the Arts, enabling Arts in the Parks to begin in summer 2016. Q: What were the challenges in creating such a large, city-wide arts program like Arts in the Parks? Hopkinson: We were forging uncharted territory in a short period of time. To deliver 350 events in 50 parks across of Toronto, including many neighbourhoods that had never experienced an arts event, required a great deal of planning. From the moment I pitched the idea to the Mayor, we then had about 8 months to put the whole project together: information sessions for the arts community, multiplying our fundraising efforts at Toronto Arts Foundation, creating the volunteer program and recruiting hundreds of volunteers, sorting out permits and logistical issues with City Councillors, City Parks and Recreation, reaching out to local neighbourhoods, as well as devising a broad based marketing campaign. In addition, we know from our research that it is important to nurture relationships locally, so we did not want to “helicopter” artistic performances into areas that had no relationship to the artists. Thankfully, our small and enthusiastic team forged connections with local neighbourhood associations, aided by partners such as Park People, Parks and Rec, and a number of City Councillors. We’ve been very successful, and each year we learn a great deal. It has been a lot of work and it’s been entirely worth it. Q: What is the biggest obstacle this program is currently facing? Hopkinson: Growing a sustainable program over the next 10 years. Right now we’re very fortunate to have a terrific volunteer Fundraising cabinet for November’s 2018 ‘Evening for the Arts’, with funds going to Arts in the Parks. Ensuring that we have multiple champions and deep relationships with the business and philanthropic communities, beyond our fundraising gala, is critical to the long term delivery of the program to Toronto residents. I’d like to ensure that we have a mixture of foundations, corporations, private individuals and political support to really make sure that Arts in the Parks is as widespread as it can be on an annual basis. Q: Can you talk about one particular Arts in the Parks experience that stands out in your mind and tell me why? Hopkinson: I recently went to the Beverly Glen Park in Scarborough (near Finch and Pharmacy) for The Colours of China presented by Little Pear Garden, an organization specializing in Chinese dance. There were wonderful performances by local professional dancers (as well as from a chorographer all the way from Hong Kong! ), and students from a local dance academy. In total there were 400 people at this lovely neighbourhood park. One of the volunteers from Park People helped to organize a bus to bring senior citizens to the event – some of them dressed in their traditional clothing to dance together after the performance. As many in the audience did not speak English, we ensured that there were volunteer translators and we distributed our audience appreciation surveys in both English and Chinese. Youth volunteers from the neighbourhood school and other community volunteers complemented the Arts in the Parks team in promoting the event. I could see for myself that this event was knitting community together – bringing seniors, youth and families all together in a celebration of artistry, culture and emerging talent. It really did bring goosebumps to my arms as I saw city building in action. Q: Where do you hope to see Arts in the Parks in 5 years’ time? Hopkinson: I’d love the Arts in the Parks brand to be widespread and well understood. I want the general population to know that there’s incredible free arts programming in their local neighbourhoods throughout the summer…that Toronto really has something to celebrate in its artists! I’m confident that the crowds will continue to grow, and that we’ll be able to have either more parks on board or more events throughout the summer in each park. In 5 years’ time, wherever you go, there will be something exciting, interesting, surprising and inventive for you to experience, something that you can bring your family to and that your children can get involved in, and something that entices your neighbours out of their apartments to come and mingle with their community. Q: Why should the people of Toronto care about Arts in the Parks? Hopkinson: It is truly community building at its best, at its most positive, and at its most joyful. 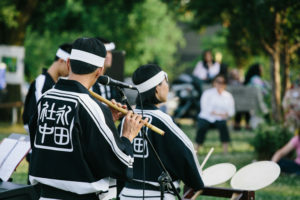 Toronto Arts Foundation’s Arts in the Parks brings free, family-friendly arts events to parks across Toronto in the summer each year from June to September. Events include performances, dance, music, theatre, film, community-engaged work, and temporary installations by arts groups. Arts in the Parks launched in 2015, and is presented in partnership with Toronto Arts Council, the City of Toronto and Park People. previous post: To The Table: A gathering place in a small outdoor space.